The player has completed 3 or more professional seasons – qualified by 11 or more professional games (for an 18/19 year old player), or 1 or more professional games (for a player aged 20 or older). This can include NHL, minor league, and European professional league seasons played while under an SPC. The entire list of players at risk can be found below, but make sure you check out CapFriendly for more detailed information on how they could avoid the designation this summer. 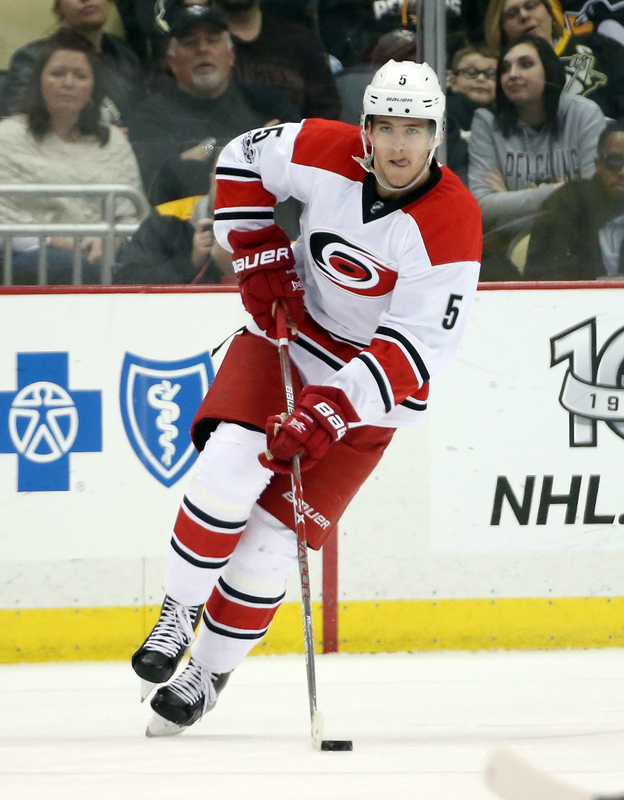 In a much smaller move than the one we saw yesterday, the Montreal Canadiens have acquired defenseman Keegan Lowe from the Carolina Hurricanes in exchange for Philip Samuelsson. Amazingly, both players are sons of former NHL players, Kevin Lowe and Ulf Samuelsson—who is actually the head coach of the Charlotte Checkers where his son will now play. This isn’t the biggest deal we’ll see this deadline but perhaps it is just another crack in the dam and deals will start to come through. Lowe does still have some upside after being drafted in the third round in 2011. A solid AHL defenseman, if his puck moving ability ever improved he could crack an NHL bottom pairing. It wasn’t going to happen in Carolina though, behind a young mobile defense corps. Samuelsson was drafted in the second round in 2009 but hasn’t turned into the player Pittsburgh had hoped for. Instead, he’s bounced around a bit and is not expected to make much of an impact in the NHL ever again. He’ll be 26 in July and will now hope to make an impact under his father’s tutelage. Ulf played over 1000 games in the NHL, and was one of the most feared checkers in the league—perhaps he can show his son a thing or two about lining guys up over the middle. St. Louis announced a total of nine signings, mostly players who will play for their AHL affiliate in Chicago. Most prominently among them is D Chris Butler, who re-signed a one year contract; financial terms were not disclosed. Butler played in just five games with the Blues last season but has played a total of 387 NHL games in his career. Buffalo has signed C Derek Grant to a two-way contract, according to TSN’s Darren Dreger. Grant played in 15 games with Calgary last season, recording one assist while averaging 10:53 per game. He also recorded 26 goals in only 37 games with AHL Stockton last year. The Canadiens signed D Philip Samuelsson to a one year, two-way deal, according to a team release. Samuelsson spent most of last season with Arizona’s AHL affiliate in Springfield but suited up for four games with the Coyotes in 2015-16. Montreal also announced they have signed winger Chris Terry to a one year, two-way deal. Terry had eight goals and three assists in 68 games with Carolina last season. Winnipeg announced the re-signing of D Julien Melchiori and G Jamie Phillips to two year, two-way contracts. Melchiori would earn $625K at the NHL level while Phillips would get $675,000 in the NHL. The Predators announced that they have inked C Trevor Smith to a two year, two-way deal. The deal carries a cap hit of $612K at the NHL and guarantees him $475K over the two seasons according to General Fanager. He last played in the NHL with Toronto in 2014-15 and spent last year with Bern of the NLA. In a separate release, the Preds also have signed winger Harry Zolnierczyk to a one year, two-way contract. He’ll earn $575K in the NHL and $150K in the AHL. Zolnierczyk played in 24 games with Anaheim’s AHL affiliate last year as well as suiting up for one game with the Ducks. Edmonton’s has signed D Ethan Bear to a three year, entry level deal according to their Twitter account. Bear was the Oilers’ 5th round pick (124th overall) in 2015 and spent last season with the Seattle Thunderbirds of the WHL. James Mirtle of TSN tells us that the Maple Leafs have signed D Justin Holl to a three-year entry level deal, following his strong season for their AHL affiliate last season. Holl put up 21 points in just 60 games on the AHL’s best regular season team. After extending their new number one goaltender, the Lightning have re-signed AHL netminder Kristers Gudlevskis to a two-way deal. The 23-year old made his NHL debut last season, starting one game for Tampa Bay where he allowed one goal on 32 shots.